Hello everyone. We’re on the countdown to New Zealand Babywearing Week (6 – 14 October 2012) and we are looking forward to celebrating with you. Over the next few weeks we will be continuing our fantastic giveaways thanks to some generous product sponsors. The next giveaway will be drawn once we reach 1600 page members over on the New Zealand Babywearing Week facebook page. 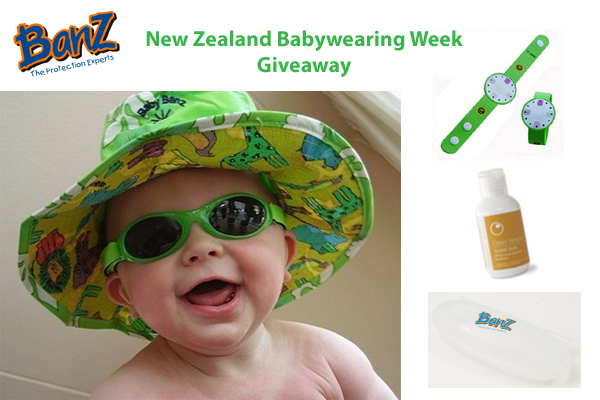 Our 1600 liker giveaway sponsor is Baby Banz NZ. One lucky ‘New Zealand Babywearing Week Facebook page’ member will be randomly drawn to win a Banz Sun-Safe Kit, valued at $117.00. (Open to NZ residents only). Included in the Banz Sun-safe Kit is a Banz Classic Tropical Green sunhat in Baby size (0-2 years), a matching pair of Adventure Banz sunglasses in Lime Green, a sunglasses case, a UV indicator, a tote bag and a 60ml Oasis Sun organic sunscreen. The perfect babywearing accessories! Visit the Banz website to check out the fabulous range of sun safety products on offer. Like the Baby Banz NZ Facebook Page. Update your Facebook status with the following: “I’m in to win a Banz Sun-Safe Kit with @New Zealand Babywearing Week and @Baby Banz NZ. You will need to ‘like’ the New Zealand Babywearing Week and Baby Banz NZ Facebook pages for the tags to work and remember to make sure your update is shared as ‘Public’. To do this click the drop down menu to the left of the ‘post’ button in your status update section on your wall and choose ‘Public’. Leave a comment under this post to let us know why you would like to win the Banz Sun-Safe Kit. This entry was posted in Giveaways and tagged Baby Banz, baby carrier, baby sling, international babywearing week, kids sun hats, kids sunglasses, New Zealand Babywearing Week, NZ Babywearing Week, sun safe. Bookmark the permalink. as of this time I don’t have a summer hat or glasses for Mr 13 months or sunscreen because I’ve never been sure which lot to buy. Would love to win this! I would love this as I have a little redheaded baby and we need to be very careful with him in the sun. I don’t want him to get sunburnt like his farther and I did when we were kids (we are redheads too). I don’t want him to be contained inside though because of his fair skin and have been looking for some organic sunscreen for him. I would love to protect my little guys skin and eyes with this awesome set, (I am so fair and he has inherited my skin which burns so easily) he would look super cute in it too! I’d love to win this as my wee one loves to be outside in the sunshine. it would be great to know she was properly protected from the sun and have more time outside! Would absolutely love to win this for our little one… have heard such great things about the brand and the products!!!!!!!!!!!!!! My boy is often outside rain or shine and spends more time outside during the summer so this would be very useful for the hot summer days as he also has quite sensitive skin to the sun ! Would love to win this as why should it only be the adults who are protecting their eyes from the sun! and such wonderful products to win! I bought some Baby Banz for my son Sam last Summer…and now I cant find them! Argh!! Love Baby Banz…Samuel looks super cute while being protected from the harsh NZ sun! I’d like to win some Baby Banz because our baby’s eyes are precious and we want to look after them! We’re about to bring our first bubs into this world in 3 weeks time! We’re both big outdoor lovers and spend a lot of time in the sun surfing, doing triathlons, running, swimming and cycling – we want to make sure our lil’ boy will be fully protected right from his first summer, this kit would be perfect and so so cute!! I would love to win the Banz Sun-Safe Kit! Skin cancer runs in my family so making sure my son is sun smart is super important to me! It is so important to practice sun safety, especially here in New Zealand!!! I would love to win the Banz Sun-Safe Kit to help me to protect my little girl during summer!! Our very fair one-year-old doesn’t have sunglasses or even a sun hat that fits. I’d love to win this for summer! Mr almost 18months needs a new sunhat and sunglasses so this would be fantastic to win! Id love to win as my kids spend all there summer outside! Would be fab to keep them protected!